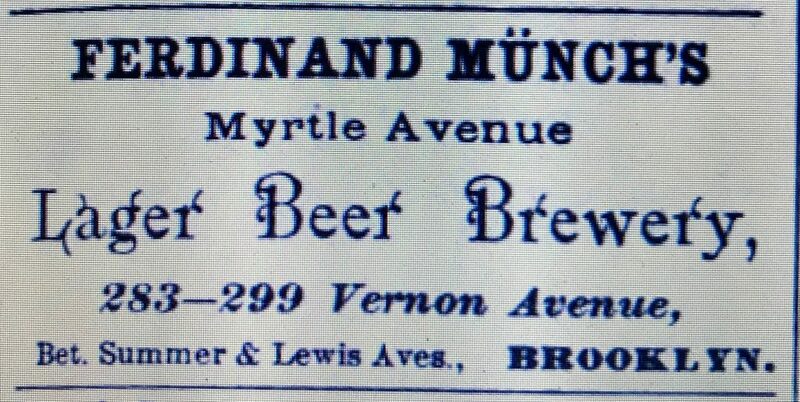 The founder and original proprietor of the Munch Brewery was a German immigrant named Ferdinand Munch who was first listed in the 1869 Brooklyn Directory as a brewer living on Dean Street, corner of Franklin Avenue. Over the next ten years he was listed at several different Brooklyn addresses and always with the occupation “brewer.” Then, according to his June 2, 1890 obituary in the New York Evening World, sometime in the late 1870’s he established his own brewery. Mr. Munch purchased the old Armory on Cobb Hill, corner of Vernon and Sumner Avenues, Brooklyn, less than fifteen years ago, and by perseverance, energy and strict attention to business, succeeded so greatly that in a few years he purchased a couple acres of land and erected a mammoth brewery with a yearly output of 50,000 barrels of beer. 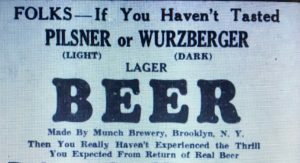 Munch’s brewery was first listed at the Vernon and Sumner location, 283-299 Vernon Avenue, in the 1882 Brooklyn Directory and based on the following advertisement, printed in that directory, he was certainly up and running at that time. The advertisement located the brewery on the block bounded by Vernon, Sumner, Myrtle and Lewis Avenues, where it remained until at least the early 1920’s. Munch ran the business until his death in 1890 at which time the business incorporated and his son Frerdinand Munch, Jr., took over. Munch Jr.’s June 14, 1897 obituary in the Brooklyn Daily Eagle described his role in the brewery. After leaving school he associated with his father in his business and when the latter died about seven years ago the present stock company was formed and young Munch was elected to the presidency of the corporation. He retired from active service in the business about a year ago on account of ill health. Two of Munch Sr.’s other sons, William and Otto, were involved in the management of the brewery for several years after Munch Jr. retired. William was listed at the brewery address between 1897 and 1904 and Otto between 1901 and 1904. During some, if not all of this period, William served as president and Otto secretary of the corporation. Beginning in 1905 the directories don’t associate any Munch sons with the Brewery so its not clear who was running the business. By 1913 – 1914 the family was not directly involved. That year Brooklyn’s Copartnership and Corporation Directory listed: Ernest F. Dissler, president; Robert Weigel, secretary and William Muller, treasurer. The Ferdinand Munch Brewing Co., 277 Vernon Avenue, Brooklyn, N.Y., have let contracts for the erection of a new bottling house to cost $10,000. 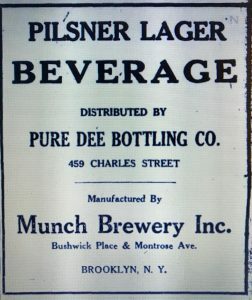 In February, 1917 the bottling plant was listed in the NYC telephone book under a new company name, the Munch Brewery Bottling Dept., Inc. Its address of 1022 Myrtle Avenue appears to have been located within the same block as the main plant on the corner of Myrtle and Sumner Avenues. That year, the Ferdinand Munch Brewery was listed in the same directory with the Vernon Avenue address but one year later, in 1918, only the Bottling Department was listed. Coming to the United States shortly after the turn of the century, Mr. Hittleman went to work at the Ferdinand Munch Brewery in this borough as a clerk. He became general manager and in 1919 purchased the company and became sole owner. 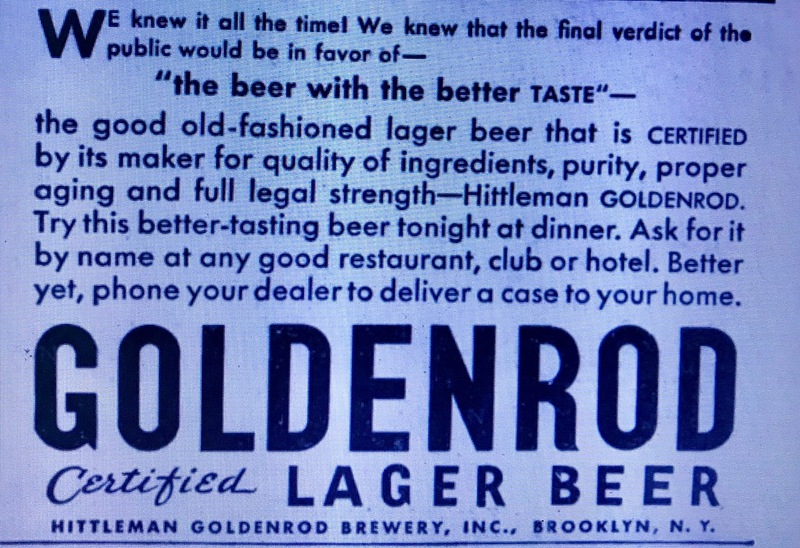 Brooklyn’s 1922 Copartnership and Corporation Directory listed Hittleman as the president and treasurer of the Munch Brewery Bottling Dept., Inc.
Around the same time it appears that Hittleman had also acquired the old Otto Huber Brewery, originally calling it the Hittleman Golden Rod Brewery and later, the Edelbrau Brewery. 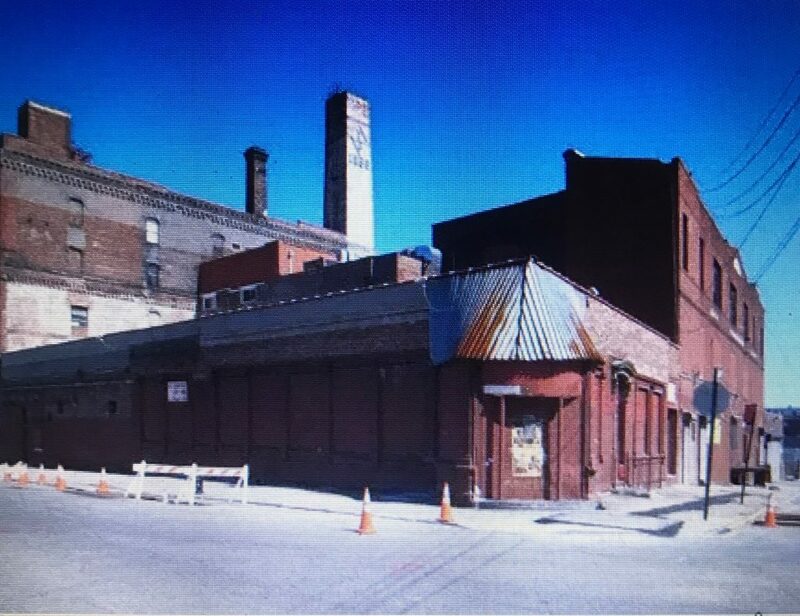 Information on the brewery prior to the acquisition by Hittleman is presented in another post on this site entitled “Otto Huber Brewery, Brooklyn, N.Y.
Hittleman’s obituary went on to say that 1n 1925 he merged the two companies. In 1925 the Munch Company was merged with the Edelbrau Brewery, Mr. Hittleman becoming president of the corporation. 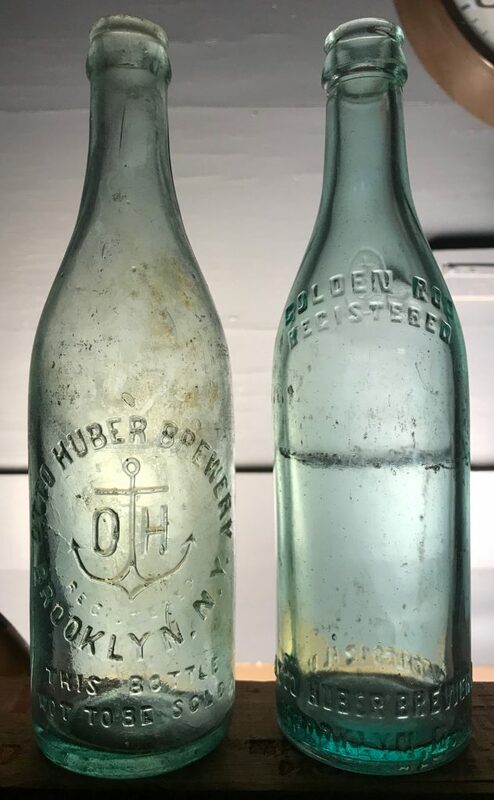 During this time the Munch Brewery Bottling Dept., Inc. continued to be listed, initially at 1022 Myrtle Avenue and later at several different Brooklyn addresses including 13 Wycoff Avenue (early 1920’s) and later at 92 Stanwix Street. 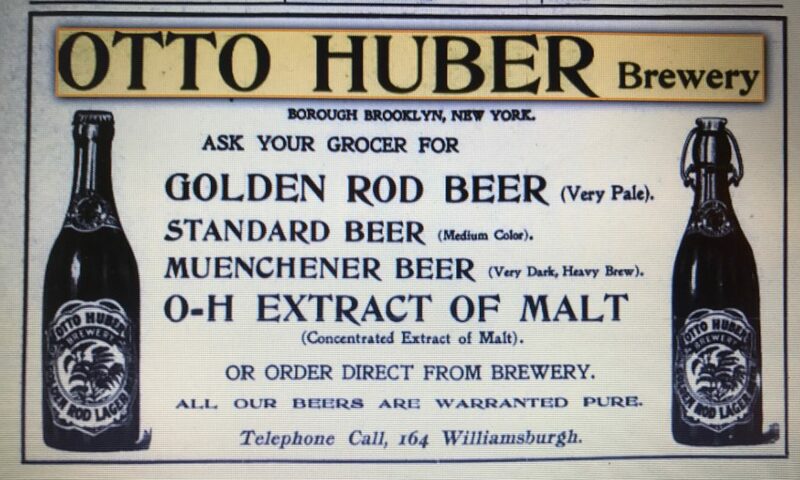 Sometime in 1927 the company name changed again, this time to the Munch Brewery, Inc., and in the 1928 Brooklyn telephone book their address was listed as 1 Bushwick Place, the address of the old Otto Huber Brewery. This June 13, 1927 Bridgeport (Connecticut) Telegram advertisement for their near beer was the first one I could find that exhibited the new name and location. 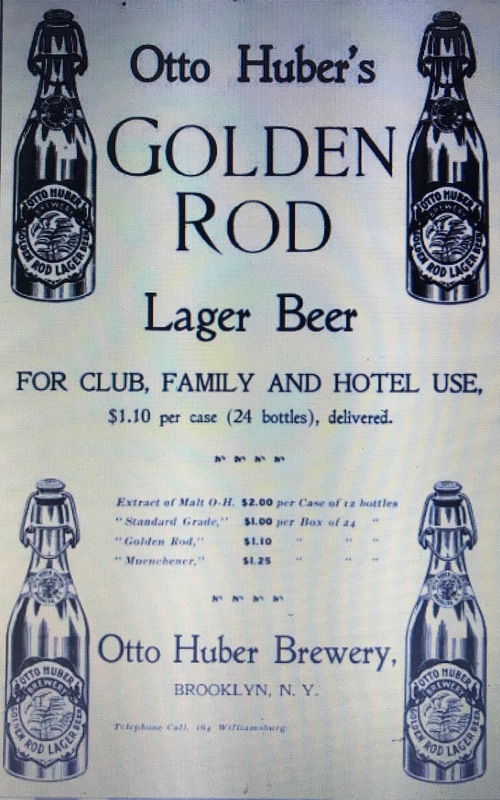 The 1928 phone book also listed the Hittleman Brewery at the same address so it seems that by then, and possibly earlier, the operations of both companies had been consolidated at the old Otto Huber plant location. Nevertheless in 1933 they were still producing beer under both company names. The first advertisement shown below, referencing the Munch Brewery, was from the May 13, 1933 edition of the Palm Beach Post the second, mentioning Hittleman Golden Rod Brewery, is from the August 17, 1933 edition of the New York Daily News. By this time, they were also marketing another brand called Edelbrau and as early as 1930 phone book listings included the Edelbrau Brewing Company at the 1 Bushwick Place address as well. 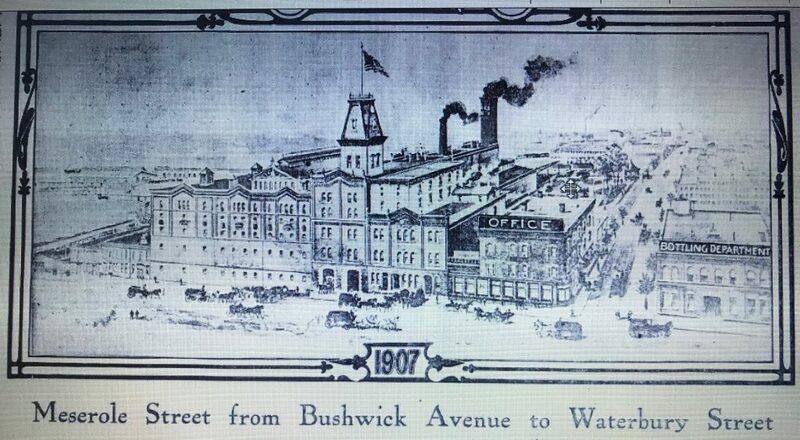 During much of the 1930’s the Munch Brewery and Hittleman Brewery along with the Edelbrau Brewing Company (sometimes Edelbrau Brewery) were all listed in the directories at the 1 Bushwick Place address. Then, sometime around 1940 the listings for Munch and Hittleman disappeared leaving just Edelbrau. 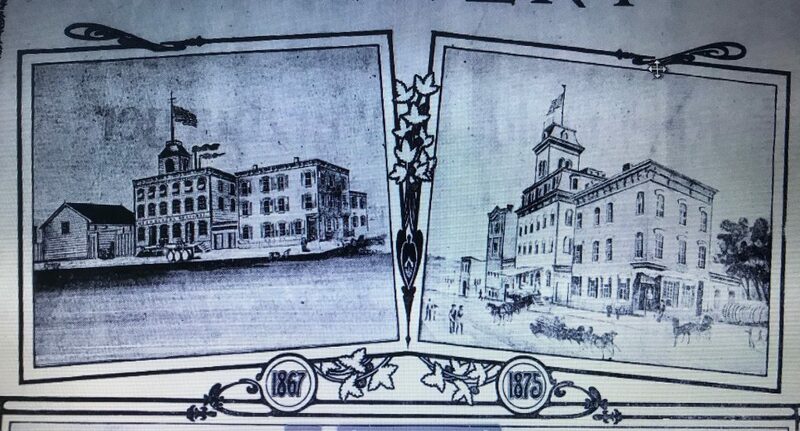 (Dating back to the Otto Huber days) The plant was originally established at its present site in 1861. Today it employs 250 workers in a modern eight-story building several hundred thousand square feet in area. The brand name Edelbrau came into existence in 1928. 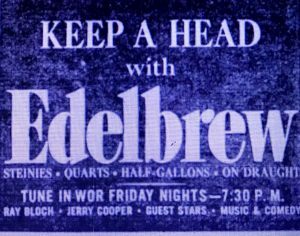 This year (1941), in order to simplify pronunciation, it was changed to Edelbrew. The beer is marketed throughout New York, New Jersey, Pennsylvania, Maryland, Connecticut, Massachusetts, including exports to foreign countries in the Americas, Central and South America, Asia and Africa. Extensive improvements and extensions to the brewery proper and bottling plant have been made and are still continuing. Since 1928 there has been a tremendous increase in sales in the Edelbrau plant. Edelbrau has just installed more modern machinery as part of its expansion, capable of bottling 300 bottles a minute per unit. Previously hops were purchased abroad, but today they are grown in New York and rank with the finest crops. In the past year Edelbrau has exported a great deal of beer abroad for use by the British army in Egypt and the Near East. The article went on to describe one of their marketing strategies relating to bottle size. 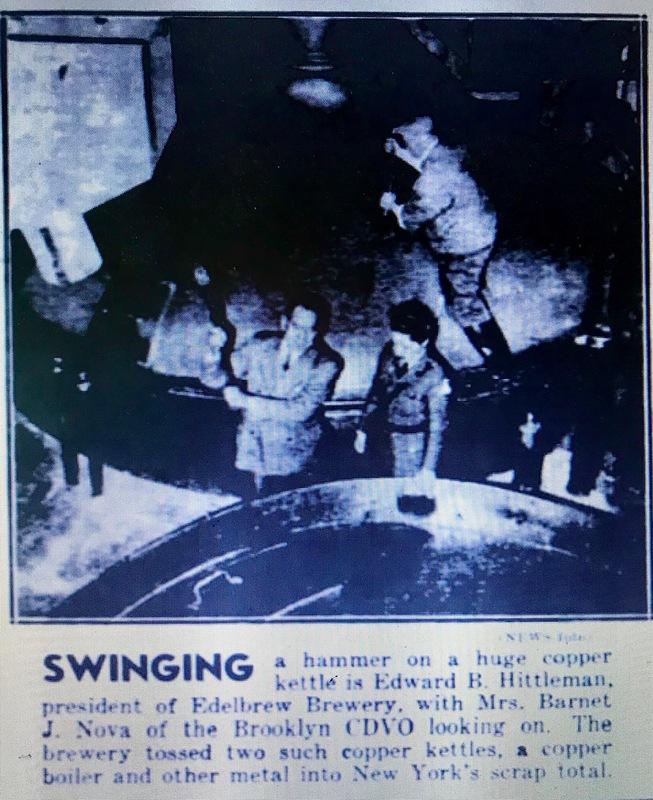 According to E. B. Hittleman, president of Edelbrau, the brewery was the first in the United States to to introduce the solo bottle which contains a single glass of beer. The brewery was also a pioneer in marketing the half-gallon jug of beer. It is now producing the largest and smallest container of beer in the United States. What became of the original Munch Brewery on Vernon Avenue is unclear but today the block accommodates a large 1950’s era apartment building under the control of the New York City Housing Authority. I found two bottles with identical embossing. One is aqua and export style the other brown and champagne style. Both are machine-made. 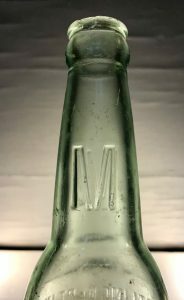 They most likely date between 1917 and 1927 when the embossed company name “Munch Brewery Bottling Dept., Inc.” appeared in the directories. I’ve also found a machine-made, export style Hittleman bottle that probably dates between 1925 and 1940. 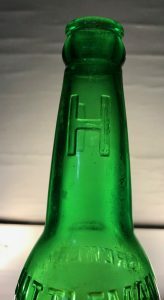 The bottles all exhibit similar characteristics including a large single letter on the neck that represents the company name.